It is time to finish "the box car shoe house!" Over the last 8 weeks we've been working to make a 8ft by 4 ft shoe that's 6ft tall and on wheels!! For our last day, we set to making our last touches and attaching the wheels to make our boot into a roller skate! One of our first tasks was attaching the rest of our shoe fabric uppers and getting our fabric laced with giant shoe laces! We also made a poster about our shoe! Specifically, we added stories of mistakes we made and what we learned. And here's our crew taking the show out for a spin! It worked great!! But, was a little too large for your shop (lol!) and could only go about 10 ft forward. We had a great time building this project, certainly tons of unexpected fun! Thank you tinkerers! Henry holds up our plans—for wheels!!!! Just part of the exciting work that happened today. Here Sloane works on cutting one of our last supports for the shoe! With them in place, we worked on attaching and painting walls! Me: "Oh, yeah? Then we'll get this done so quick!" All the sudden our screws kept going through the ply and getting stuck and causing so much drama! So tricky! We had to try try try again. Totally eating our words before ("sooooooooooo hard") now. Then we struggled getting screws to go in properly to our little guide piece of wood (to keep the seam straightened). We also started working on our wheel supports and axels. First step, cut to size. Then drill holes in for the axels! We're back to work on the boot! This week, we started off our build session with a check-in meeting to review what needed to be done for the day. As we gathered around our giant-boot-to-be, leaning on the wooden beams, we realized that that whole thing swayed from side to side. Thus, we decided to devote some efforts to stabilizing the giant structure, starting with the shoe's "toe." We also set out to finish the "ankle" section of the shoe. 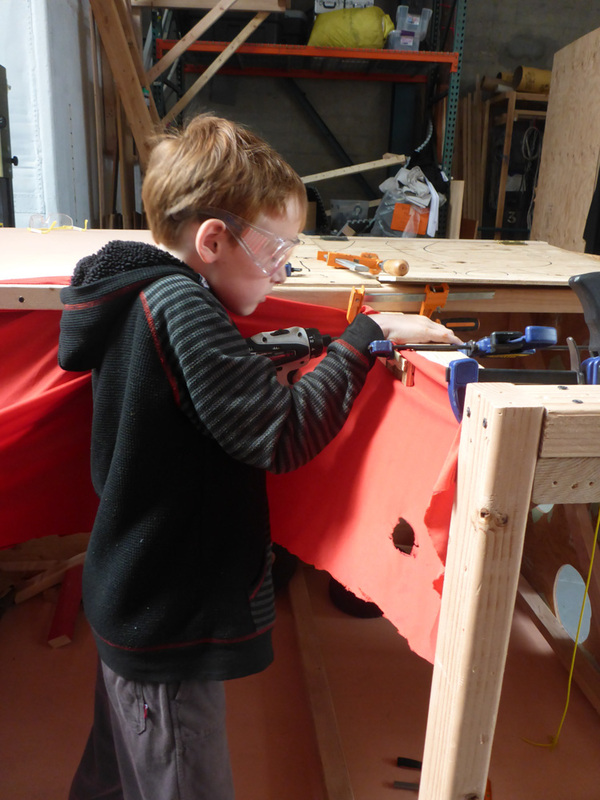 In order to make our stabilizers, we needed to make to miter (diagonal) cuts on the saw. These allowed us to make sturdy triangle shapes and prevent further swaying to and fro. Attaching the "ankle" section of the boot involved a lot of drilled and driving. We definitely got our drill practice in! We also had to (safely) stand on stools to reach some of the high places! Finally, in the final minutes, we began attaching side panels to our shoe! It's really starting to take shape...how exciting! Our giant shoe is beginning to take form! This week we were back and tinkering in full force. We reviewed our plan from last week and caught everyone up to speed on the brainstorming, designing, and building that had taken place the last time we met. We determined the wood we would need, made a cut list, and hit the chop saw room! And then, we connected it all together! We used our corner jigs and bar clamps to keep everything in the right place as we drilled lots of holes and drove lots of screws. And now we've got this ginormous box-car-shoe-frame almost built, nearly ready to be covered and accessorized! We're building a GIANT SHOE! And loved them all, too." This old English nursery rhyme will be the inspiration for this session's project! Whoa! Weird. Whacky. Let the building begin! 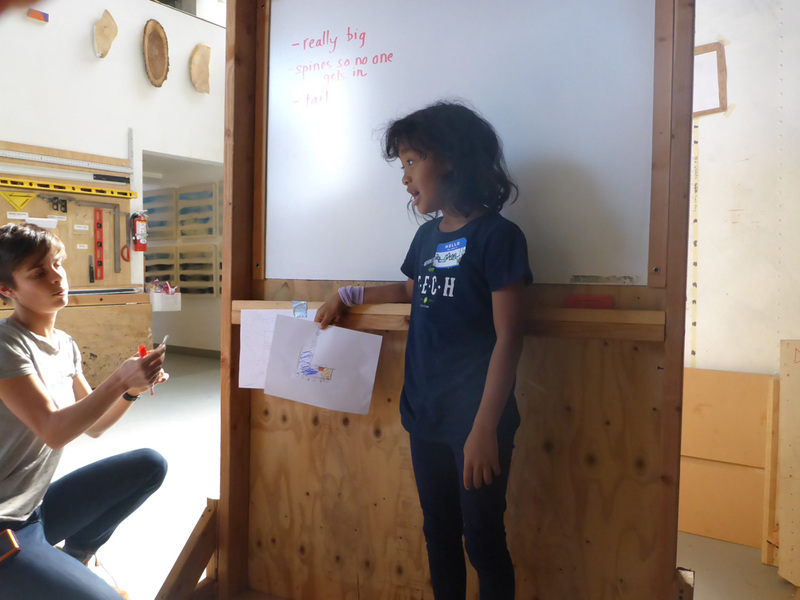 Here at Tinkering School, we always begin each project with a giant group design process. We have no idea where any of our projects will go until we get the input from all of the brains in the room! We start with 10 minutes of independent ideation before sharing our brainstorming with the entire team. Each person has a chance to share at least one idea before a group design starts taking shape. When it came time to land on a design blueprint, we investigated the material options we had in the shop and sketched out a giant shoe frame. This shoe is going to be eight feet long! Finally, we began working on the shoe "sole." We cut pieces of 2x3 wood to length in the chop saw room. We clamped our plywood sole to a piece of 2x3 for support. And we drilled, drilled, drilled! And that's where we left off! See you next week! Tuesday After School - Day 1 ! Today a new group of tinkerers came together for a new after school session. Some veterans returned and a lot of brand new faces! After Max showed us how his rubberband powered plane flies, we got to know each other, talked about ways we can treat ourselves, others, and the space to make our tinkering experience great, and got right to tool training! While we practiced the safest way to use the tools we also worked on the tinkering school goals. We learned how to line up a cut. We practiced checking ourselves, our friends, and our environment for safety. WE CUT PIECES OF WOOD IN HALF WITH A CHOPSAW!!!!!!!!! We collaborated with each other. And we learned from our mistakes. We started building a new community of tinkerers and next week we'll be putting our heads together to design the project! !